With the recent approval of .BRUSSELS, .BZH, .SURF, .TIROL and .VLAADNEREN domains, the number of new Top Level Domains has exceeded the number of extensions established before the introduction of the New gTLD Program. 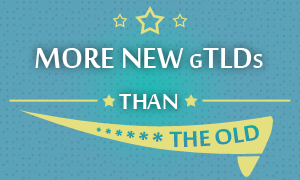 In total, there are currently 312 new gTLDs approved by the International Corporation for Assigned Names and Numbers (ICANN) compared to 308 extensions created before the launch of the new gTLD Program. The latter include the oldest domains, such as .COM or .GOV, 285 country code domains (including 36 IDNs) and 15 global domains added to the root zone in 2000 and 2003. New registered and reserved TLDs make up for almost 1.2 million domain names, which is 0.4 percent of all registered domains. Now, of the nearly 1,500 new gTLDs approved by ICANN, only 140 is in the phase of General Availability. The remaining extensions are either within the Sunrise phase of undergoing tests. If you want to take advantage of new addresses coming to the Internet, consider registering a domain name that will best define the nature of your website and click on the domain of your choice. For questions or help, contact our Support Team at support@web-solutions.eu or via phone on +44 (0) 208 133 3994.